Yorkshire’s own online estate agent has expressed some concern over the implications of the merger of two of the industry’s bigger players. Tepilo, which used to boast TV presenter Sarah Beeny as a director, and former market leader Emoov – usurped from the No 1 slot by PurpleBricks – are reported to be poised to link up in an attempt to knock their well-financed rival of its perch. With Brexit prompting a slow-down in the housing market as vendors await the outcome, some consolidation was perhaps inevitable. 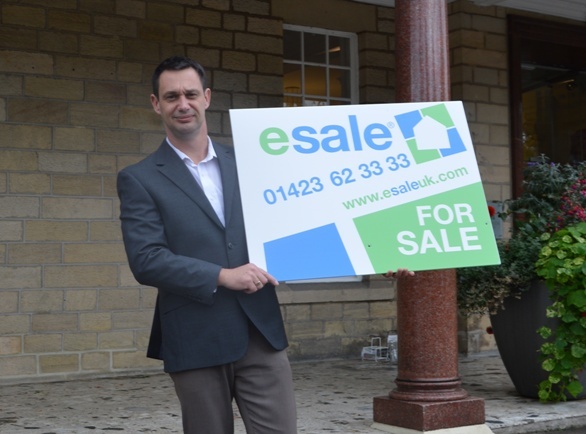 But MD of Harrogate-based eSale, David Rook, is worried bigger won’t necessarily mean better and has urged anyone considering selling their home this summer not to accept poor customer service – particularly if they choose one of the bigger online agents to reduce their moving costs. Mr Rook said: “When things are a bit tight, mergers and stock market flotations are a way of raising much needed capital. But, once that’s done, we can probably expect another surge of high-profile marketing as the new-look online agencies reassert themselves. “But one thing which worries us a little is where the customer stands in all this? Mr Rook conceded that the bigger players – both online and on the high street – look strong when it comes to their property portfolios. However, he added: “Quite a few of us still remember when the manager at the high street bank knew your name but, as they became part of international companies, personal service seemed to diminish. “So, if online agencies continue to grow, who answers the phone when your sale seems to have got stuck? Who keeps tabs on solicitors and knocks heads together if necessary to keep things moving? Who checks out your potential buyers or gives you feedback after a viewing? Who do you complain to if you’re not happy and, more importantly, what will they do to put things right? “So, as we stand on the brink of a new era – possibly dominated by fewer but larger cut-price online estate agents – we’d urge you to remember this: just because you’ve chosen to pay less than you would if you went with a high street estate agent, it shouldn’t mean you have to expect poor customer service. “If you’re not happy, say so. Hopefully, if enough people are clear with their opinions, we won’t see the levels of service decline; the new-look firms will have to build an ability to respond into their DNA.